Poking around the GSS for another reason I stumbled onto something weird. Something which I’d seen hints of, or seen referred to before, but never followed up myself. It seems that support for abortion-on-demand and the death penalty peaked concurrently in the span between 1980-2000. This is evident in two GSS variables, ABANY and CAPPUN, which ask if you support a woman’s right to an abortion for any reason and the death penalty for murder. Additionally, I decided to look at attitudes toward homosexuality using HOMOSEX as a reference as a point of contrast. Unlike abortion or the death penalty attitudes toward homosexuality have been changing in the same direction for the past 30 years. Additionally, the magnitude of the change seems to be much greater than in regards to the other two controversial social issues, and especially abortion, which has exhibited notable stability. I was particularly interested in differences by religion, so I limited the sample to whites and broke it down by Protestant, Catholic, Jew and None. To reduce sample size volatility I clustered by decade, so that “1970s” is inclusive of every year in the 1970s that the GSS asked the question for that variable. The only thing I note beyond the concurrency is that the more socially liberal groups, Jews for example, seem to exhibit more fluctuation by decade. Conservatives are conservative in part because they reflect older norms on issues where they are conservative. The issues which defined liberal vs. conservative in the 1960s, for example attitudes toward desegregation, are no longer salient because conservatives how now aligned themselves with liberals (there are other issues where the reverse may be true, especially when it comes to the failure of Great Society. I suspect that many, though not all, 1960s liberals would admit that AFDC as it was implemented before the Clinton era reform was not a success in defeating the culture of poverty). It is also notable that in the 1980s Jews were more pro-death penalty than Catholics or those with no religion. I think this might have to do with the massive urban crime wave which was peaking back then. I remember how much preparation for street crime people went through in the 1980s when visiting New York City. Jewish concentration in large urban centers where violent street crime was common might explain the shift toward the death penalty. Next, I wanted to compare the relationship of support for death penalty and abortion rights. The columns below indicate those who favor or oppose capital punishment for murder, and the rows indicate support for or opposition to abortion on demand. At the bottom you also see a ratio of those who are pro-choice and pro-life among those who support to the death penalty. So first, it seems that among Roman Catholics being pro-life suggests a small but significant tendency to oppose capital punishment above expectation. The seamless garment isn’t a total illusion, though do note that pro-choice and pro-death penalty Catholics still outnumber anti-death penalty anti-abortion Catholics. The death penalty for murderers is really popular. Among Protestants the two views seem independent, as there wasn’t a correlation in either direction. In contrast, Jews and those with no religion go the other direction as Catholics. Those who are pro-choice are more likely to oppose the death penalty, and those who are pro-life are more likely to support the death penalty. Also, look at the really huge ratio between the proportion of Jews who support the death penalty and abortion rights, over half, and those who oppose both, around 1 in 50! Note: I limited the data to the year 2000 and after, and there isn’t much of a change in direction, though the magnitude is tweaked a bit. 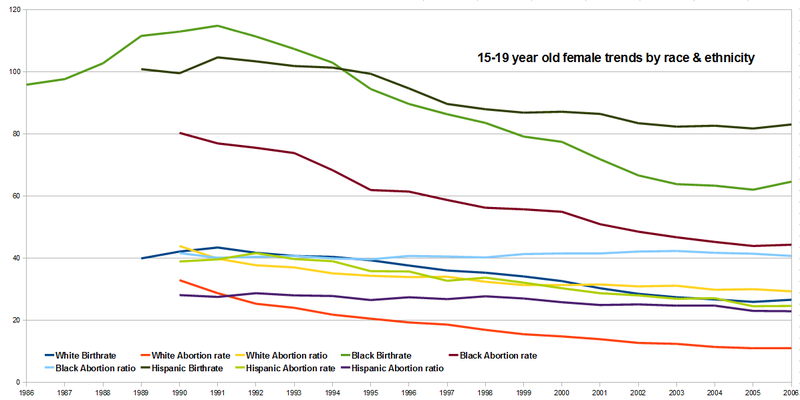 Addendum: Abortion rates have been dropping since 1990. This is due to death penalty variable. Catholics who support the death penalty are not running afoul of the seamless garment position as the Catholic Church has not staked out a clear position on the death-penalty, unlike for abortion. Respecting life from the womb to the tomb, but supporting the death penalty, is in line with the Catholic Church, although not a position which my conscience would recommend. See paragraph 2267 of the Catechism of the Catholic Church.